I have a new 925 on the way from the Newegg deal for $249. WOODBRIDGE, VA, US (you may need a free account with UPS to see the shipper info). A company with that name and that location has incredibly bad on-line reviews although most are complaints related to cell phone contracts and would not be relative to these phones. I know others have posted they ordered these from Newegg and have received theirs. Did yours come from Simply Wireless or somewhere else? My concern is since the company may be shady (based on the reviews) that these might not be actually new phones. So did you see any hint of them being refurbished? I don't want to spread any doubts but since I came to have them based on research, I'm sure others have too so this will be good to clear those doubts if unfounded as it would be to raise them if not. I've ordered a couple of phones from NewEgg. They came from a 3rd party, but I can't remember the name of the 3rd party. Their calling card came with the phone. If you have a problem, NewEgg customer service is pretty good at resolving issues. Yeah, Newegg is a good company. But Newegg is a marketplace like Amazon or Rakutten (Buy) and lists who the seller is. My screencap shows the seller to be Newegg, NOT Simply Cellular. I've spent tens of thousands at Newegg and am familiar with their customer service but want to know where the phones came from and if they check out as new. Remember Newegg sold many bogus Intel CPUs (defective units, remarked by a disreputable supplier) several years ago. The fact that Newegg made good with the customers who asked doesn't mean its not a good idea to know ahead of time or as soon as possible. I am taking up the misleading seller information with Newegg. May be just a mistake but it needs addressing. Excellent! I got my 925 from Newegg for $249.99. It was listed as $279.99, but there was a special promo code that gave me $30 off. These deals are just incredible. Seems that everyone is snatching up these 925s now. Something else I should have mentioned about phones from NewEgg, you don't always know what country they are from. I bought a Samsung Galaxy 2 from NewEgg and it was an unbranded, unlocked phone from Greece. I also bought my HTC 7 Trophy from NewEgg and it was an unbranded, unlocked phone from Germany. Many times when you do updates to the phone it will revert back to the country code that is flashed into it, and the phone will switch back to that language. It also can effect applications from time to time. No matter what I tried, the YouTube application on my Samsung Galaxy always gave me the Greek YouTube link and application. Okay, I don't need confirmation of where the phones come from. I chatted with a Newegg Rep who initially stated the phones ship from THEIR (Newegg's) warehouse. But when confronted with the UPS from address, admitted they really did come directly from Simply Wireless (a retail business with dubious reputation). Considering the source, I am still interested in hearing from people who already received theirs if there is anything that would hint at them being used or refurbished. Something else I should have mentioned about phones from NewEgg, you don't always know what country they are from. I bought a Samsung Galaxy 2 from NewEgg and it was an unbranded, unlocked phone from Greece. I also bought my HTC 7 Trophy from NewEgg and it was an unbranded, unlocked phone from Germany. These are listed as NEW T-Mobile phones. I'm a little suspicious about them being used/refurbished but I don't know what countries T-Mobile sells phones in. Are there non-English speaking countries where T-Mobile sells phones? ShopHQ has the 925 on and off for $229.99 which is an even better deal! If it says T-Mobile it's probably T-Mobile USA. T-Mobile main office is in Germany. As long as it's through NewEgg, I think you'll be fine. They'll resolve any issues if it shows up used or refurbished. I have no doubt Newegg will resolve any issues. But resolving them is not how I like to spend my time. That one's out of stock as of a few days ago. Really? That's weird. I originally tried to buy it from them and when I did, it came up as "out of stock." I checked again last night for my friend and again, it was out of stock. I figured it was out of stock all this time. Thanks for the tip! I checked on Friday and it was there, and I checked originally when WPC anounced it. QVC still has the Lumia 925 for $250. The price includes some accessories as well. Okay, I have the phone. No signs of it being anything but new in a sealed box. Manufacture date of July 2013. There are some small brown stains on the white back and the bottom of the glass has a notch in it. 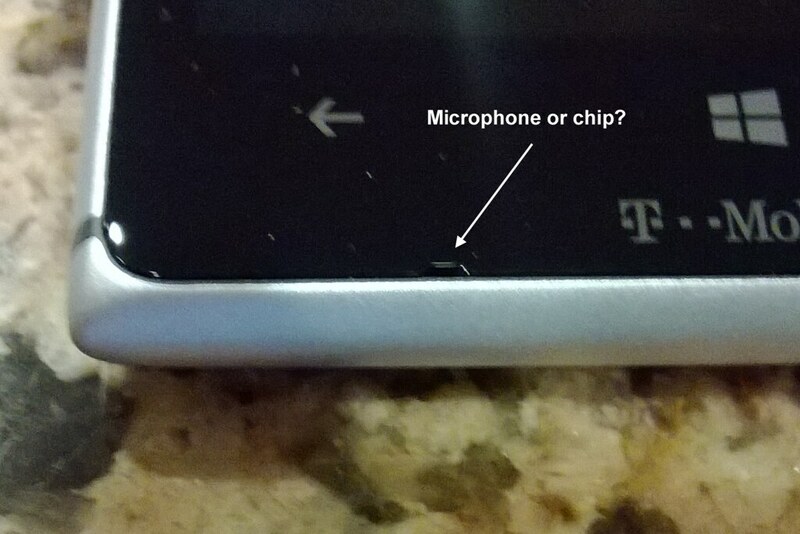 I'm hoping the notch is for a microphone behind there and not a chip. On the 521 there is a similar size notch on the opposite side of center and in the surround rather than the glass. Here is a terrible picture of the spots. The picture makes them look like smudges of some sort but they are obviously splatters of some brown liquid and much more pronounced and with sharp edges in the flesh. My 10 month old 521 white back is still pristine and never cleaned so I don't even know what's good for cleaning this material. I don't use cases so need to get these off since they are out in the open. That nick on the lower left portion of the screen on the 925 is normal. Not sure it's the microphone, though. 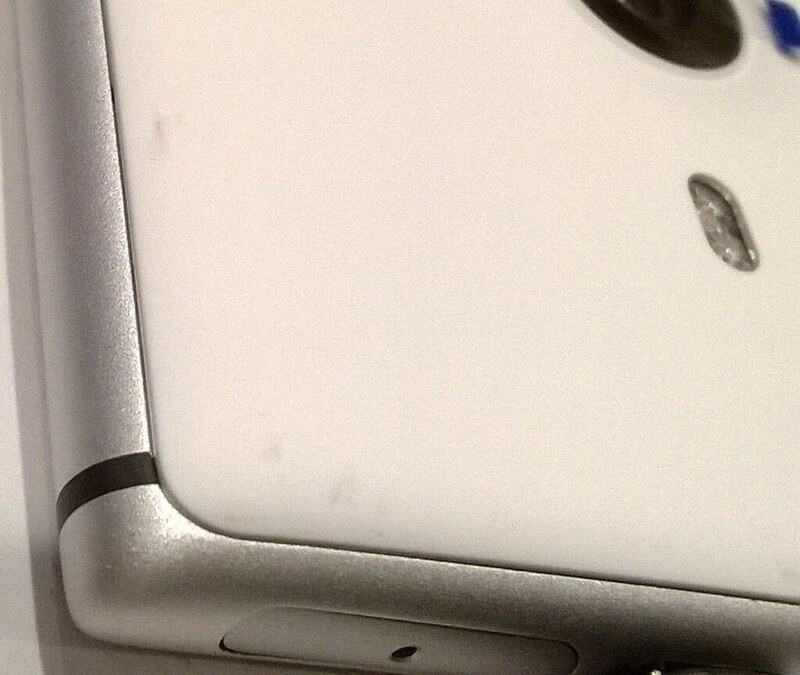 As for the smudges, that's really odd. When I got my 925 last week, it was completely clean and in perfect condition. Sounds like every worked out. The notch looks normal. The brown spots, try an alcohol pad. Oh my gosh... Wouldn't believe what happened to me earlier tonight. I was in the middle of a call with a friend and had my phone down on the dishwasher on speakerphone. I was beginning to feed my cat and my grandmother's dog when my cat jumped up there. I shooed him away and along with him, my week old 925 fell face down on the floor! I picked it up, fearful of seeing a cracked screen or at least a scratch, but it was flawless. Whew! I told my friend what happened and asked if she could still hear me and she replied, "Perfectly." That was a scare! It was the first time I've ever dropped a smartphone flat on its screen, and without a bumper type case at that! Were you able to remove the skid marks? I ordered from QVC and it should arrive tomorrow. It shipped from Baltimore, MD. Makes me wonder where the phone is coming from. Sorry for not posting about that yet. Yes, they came off with eyeglass cleaner. Mine also came from Baltimore. If you sign up for a free UPS account, you can see a lot more info in the tracking. My tracking said the phone came from Simply Wireless, which I was very unhappy about because I would never have bought from them based on their negative reviews. Glad to hear the spots came off. I used ResellerRating when you mentioned negative reviews about Simply Wireless, and their reviews at ResellerRatings are horrible, but they were all older reviews, from 5 to 8 years ago. I wonder if they sold the company, or just saw the light and changed their ways? Here's their reviews at ResellerRatings: Simply Wireless / SimplyCells.com Reviews - simplywireless.com Ratings at ResellerRatings If they were still as bad as their older ResellerRatings, I am sure NewEgg wouldn't want them as a 3rd party seller, because they would cause NewEgg a lot of headaches. How odd... Mine came directly from Newegg. Glad you were able to get your phone clean! Can I ask how you confirmed it came directly from Newegg? Regular UPS tracking and everything on the UPS label just said Newegg for my order. It was only in the expanded tracking info you can see with a special free UPS account (not a shipper's account) that it indicated Simply Wireless. When I talked to Newegg CS, they initially said they come from a Newegg warehouse and only when confronted with the UPS info did they finally fess up. Last edited by HoosierDaddy; 03-06-2014 at 05:42 PM. Problems with "Mobile XHCI Host Controller"